Check out Tobi's Happy Tech Set If BAN.DO's Happy Purple Tech Set doesn't make you smile, we don't know what will. This tech trio features a rainbow charging cord for iPhones and iPads, a matching rainbow phone ring, and a magnetic keeper complete with a smiley face for some extra positivity. Perfect for travel, take these three amigos with you everywhere. If BAN.DO's Happy Purple Tech Set doesn't make you smile, we don't know what will. 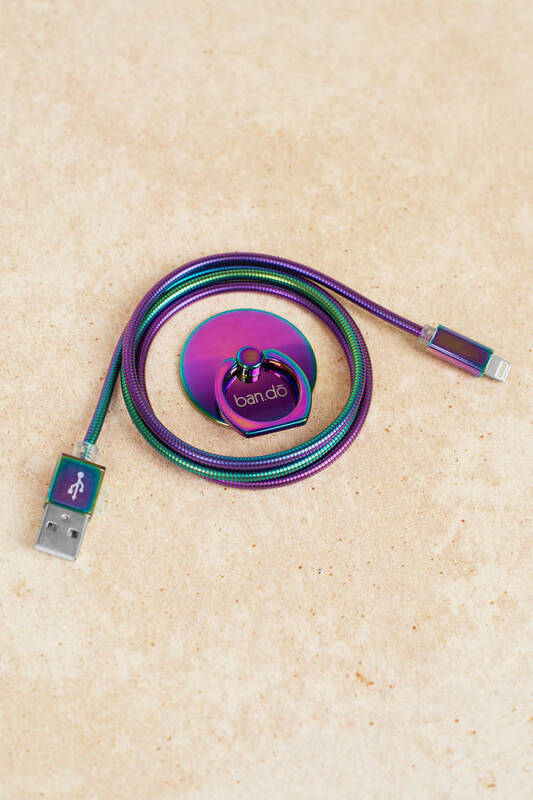 This tech trio features a rainbow charging cord for iPhones and iPads, a matching rainbow phone ring, and a magnetic keeper complete with a smiley face for some extra positivity. Perfect for travel, take these three amigos with you everywhere.